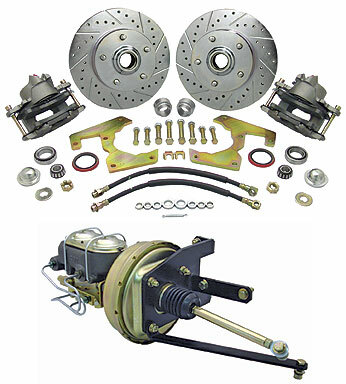 This kit contains everything at the spindle needed to change your 6-lug drum brakes to 5-lug on 4-3/4" GM passenger car bolt circle disc brakes while retaining the stock spindles. Kit includes 1969-74 Chevelle rotors, 1969-72 Camaro calipers, caliper brackets, bearings, seals, spindle nuts, dust caps, brake hoses and banjo bolts. Caliper bracket kit also available separately. Note: Factory 6-lug applications and 5-lug on 4-3/4" kits have 7/16" diameter studs.